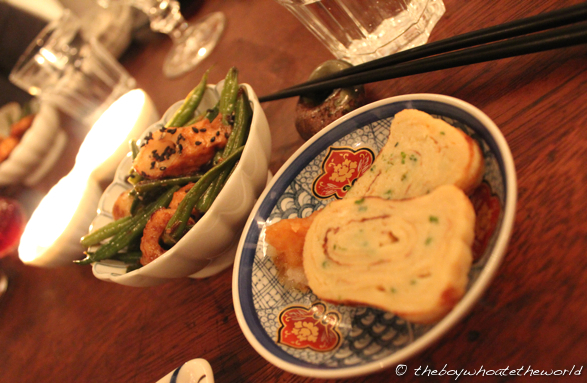 Despite blogging for a couple of years now, I’d never really explored London’s Supper Club movement until earlier this year. The difficulty in getting myself to commit several weeks in advance to dining in some secret location in the company of complete strangers remains a cause for hesitation. I had a feeling however that curiosity would some day get the better of me. Hence upon seeing Luiz’s shout-out on my Twitter feed a few weeks back that he had a couple last-minute places to fill for his Japanese Home Cooking Supper Club that night, I figured if Jo and myself were ever going to take the Supper Club dive, it would have to be on impulse. And if there was one place it made sense to start, it would be here at the home of Luiz who recently traded in his City job to focus solely on food… going to the extent of spending a couple of months in Tokyo to hone his cookery skills through a series of private lessons and a work stint at a traditional Izakaya. After a couple knocks on the door (and a split second where we wondered whether we had the right house or not), we were soon greeted by Q and R, volunteers helping out on the evening who quickly whizzed us into Luiz’s beautiful home. As we mingled with some of the guests who had arrived earlier, cocktails of G&T soon followed as well as delicious canapes of traditional Takoyaki (fried octopus balls), served up by local Japanese Catering / Pop-up company Pom Pom. Once all 20 or so guests had arrived, we were led downstairs to Luiz’s gorgeous kitchen (I remain horribly envious of his glorious AGA cooker) and adjoining extension where 2 long tables had been beautifully laid out with an eclectic mix of Japanese and oriental tableware. Once everyone was seated and the BYO drinks started to flow, our host briefly introduced himself and gave us an overview of what to expect for the rest of the evening. 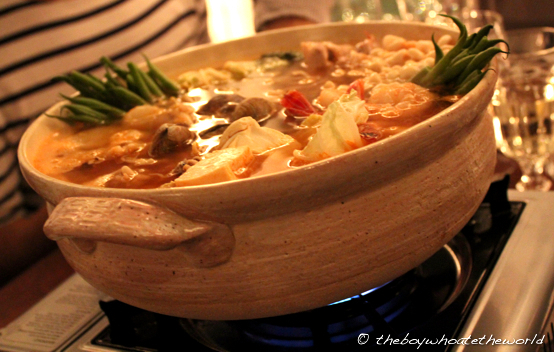 From the minute Luiz started describing the history and custom behind the first communal dish (a Nabe Hotpot brimful of pork, assorted seafood, vegetables and tofu), it was hard not to feel that same infectious passion he has for Japanese food. With the home-made dashi broth simmering away in our casserole pots, supper was well and truly underway…. And if you thought all of the £35 / head suggested donation was going towards the hotpot alone, you would be seriously mistaken. Here’s just a sneak-peak selection of the feast of dishes which followed. The generous slabs of top-grade salmon sashimi tasted fresh out of the sea. The Asian-style vinaigrette it was dressed in not only gave the dish a zing of flavour, but it also lightly cured the salmon, giving it a lovely texture. On the side, a refreshing mix of creme fraiche and diced avocado added a fusion twist. 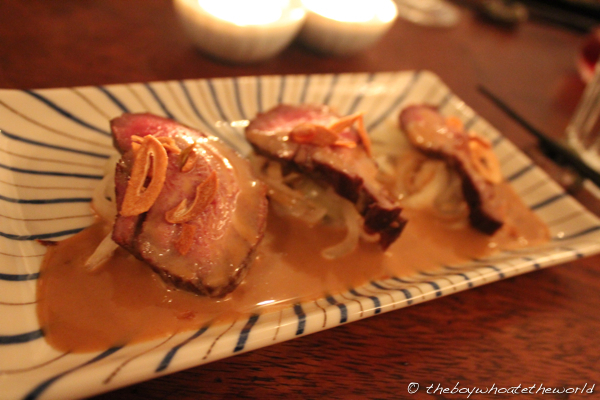 Then came the Beef Tataki – beautifully prime slices of cow served with a nutty, creamy sesame sauce. The bed of sauteed onions they were served on were a wee bit raw for my liking, but the meat was cooked perfectly to a wonderfully tender medium rare. What made the dish for me though was the aromatic crunch of the deep fried garlic slivers sprinkled on top. Yum-meh bits of gold. But it was the dessert course that was the truly outstanding dish of the evening for me. 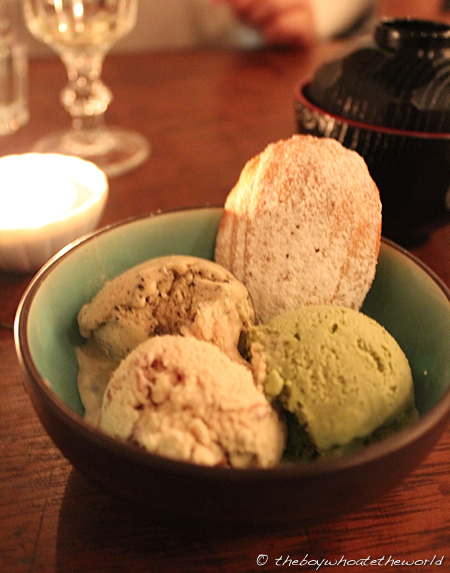 With the aroma of freshly baked Madeleines teasing our senses and flooding throughout the kitchen, a trio of classic Japanese ice-cream flavours were unveiled: Black sesame, Green Tea and Yam… All home-made. All creamy and luscious. And all stonkingly good. The icing on the cake to a quite fabulous meal. On reflection, at any Japanese restaurant in town, the £35 donation would get you barely half of what we were treated to tonight. In true Asian fashion and as is customary, we had been ploughed with food and spoilt silly by our host who understandably looked a little jaded with relief by the evening’s end. My thoughts on the social aspect of the Supper Club experience? Yes, of course there is the inevitable bit of small talk involved as you get to know fellow diners around you. But there’s also that little bit of magic when you start to realise that despite the people round the table coming from all walks of life, there’s a certain like-mindedness and bohemian camaraderie built around a love for food that’s brought the group together in the first place. And what I’ve come to know time and time again is this: throw a bunch of people who love their food together, and what you will find is a recipe with a pretty damn high success rate. Mind you, supper clubbing is not something I could do week in week out. Admittedly, the creature comfort of having a meal with a loved one or a familiar face will always prevail. But as far as once in a while experiences go, the Supper Club experience does make for one cracking night out that’s a little out of the ordinary. Thanks again Luiz for a terrific evening. I hope the rest of the Supper Club evenings are as roaring a success as this one was. I have no doubt I’ll be back at some point (if not for the food, it will be to stare longingly at that glorious AGA cooker)! p.s. 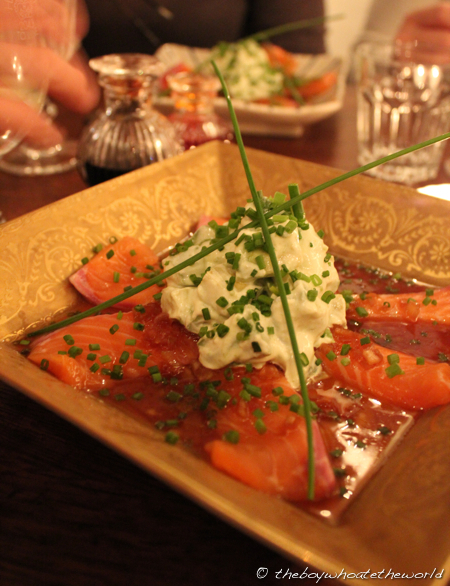 This was my first Supper club experience. And if you are completely unsure of what to expect as I was, I would recommend you read Burger Anarchy’s superb post on: [How to] A Diner’s Guide to London Supper Club’s, which will give you a flavour of what to expect and dispel any false myths or preconceptions you may have. grill a potato is to par-cook the potatoes first.